As part of my Adult Nursing studies (in my home of Jersey, Channel Islands, which is linked with Chester University), I am required to take a nursing placement. 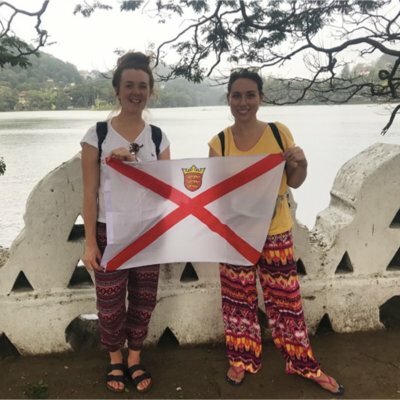 Never did I imagine when I started my adult nursing degree, that I would get the opportunity to spend 4 weeks nursing in Sri Lanka with Work the World! As soon as the opportunity to embark on an international placement was discussed at my university, I started researching. Work the World offer such a range of destinations, it was very difficult to choose. I have always wanted to travel to Asia, so Sri Lanka was the perfect place to fulfil this wish. The opportunity to be exposed to a way of nursing and culture that differs from my own back home, I hoped would increase my cultural competency. From the moment I registered with Work the World, the support I received was phenomenal. Somebody was always at the end of the phone, and I always got a reply to the many emails I sent. You also get access to MyTrip, which is an online placement planner, showing you the hospital, the house, housemates, and general pre-departure information. This is a really useful tool in the lead up to the trip, as its very well organised and easy to use. 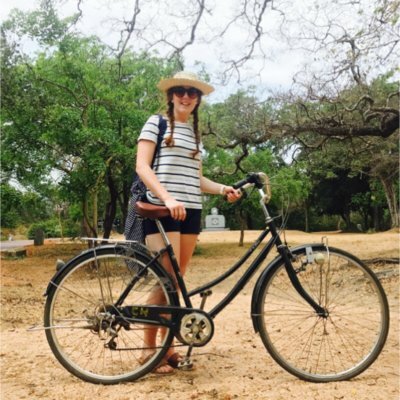 After 3 flights, totalling approximately 5,400 miles, I had finally landed in Sri Lanka. 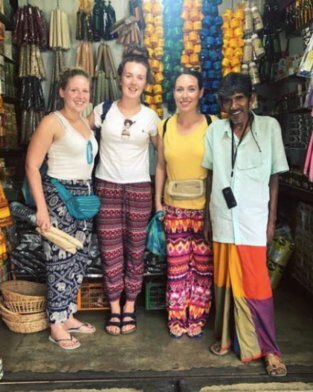 I felt a little apprehensive about the whole experience, but once I made my way through to the arrivals hall in Colombo airport, I was greeted with a lovely smile by the Kandy Programme Manager, along with other students who had also chosen Kandy for their placement. 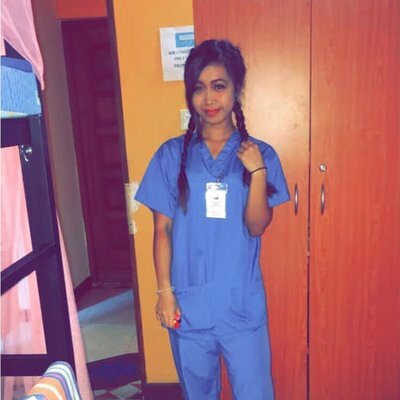 I had travelled with a friend who is also studying the adult nursing degree. The humid monsoon season weather was noticeable straight away. We got on the minibus and were driven through Sri Lanka to reach the city of Kandy. We stopped off halfway through the drive for our first taste of the local cuisine: curry! Eventually, we made it to the Work the World house. I knew that I would be sharing a room with my friend that I had travelled with, along with 2 other students. 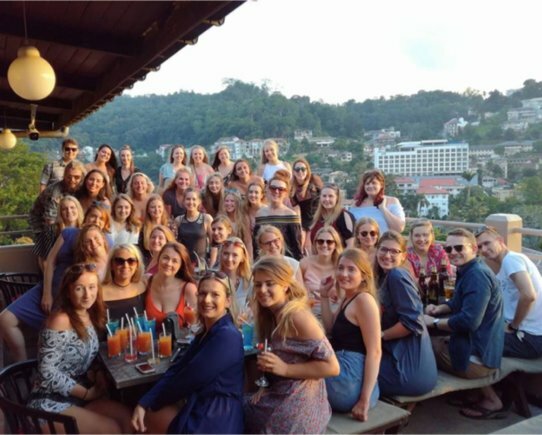 During my time in Kandy, the house was full, meaning there were about 36 international healthcare students all living under one roof. This added to the great learning opportunity, as it was fascinating to hear about the others students experiences. I met people from America, Canada, Belgium, The Netherlands, Germany, Scotland and other parts of the UK. 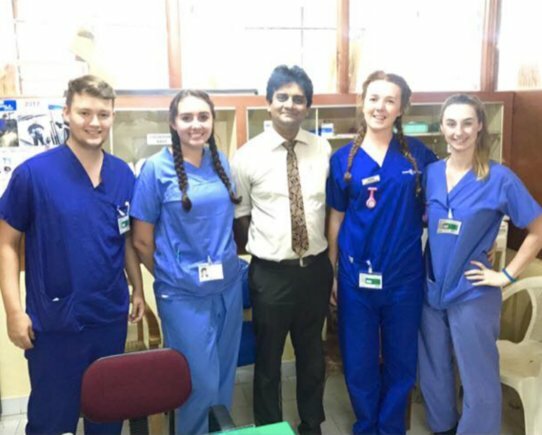 Whether they were training to be a doctor, a nurse, physiotherapist, midwife or dentist it was fascinating to listen about their training and life in their home country. There was plenty of living space throughout the house. A living room on every floor, a dining room where we all ate together, a kitchen, several balconies, and the rooftop which is the perfect space for the weekly BBQ night! The bedrooms are shared between 4 people all with an en-suite bathroom. 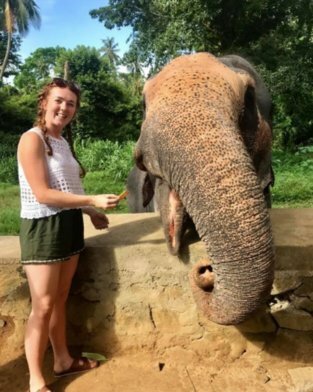 Along with students, we also had to live with wildlife - there was often monkeys on our balcony trying to take our washing...so a word of advice, only use the communal drying area as this is protected! In order for the house run smoothly, there are some fantastic Work the World staff. The 24hr guards were always there to greet us with a smile at any time of the day. They were on hand to help with the power cuts that occurred from time to time; all part of the experience! We became really fond of the staff at the house, including the lovely housekeeper and very talented chef. Monday to Friday (and Sunday evening) he would provide us with 3 freshly cooked meals. For a person like myself who isn’t a fan of spicy food, I never went hungry. He catered for everybody’s preferences and dietary requirements. Every week he also held a cooking lesson where we had the opportunity to learn how to cook a Sri Lankan dish. Knowing that this was going to be my home for the next 4 weeks was very exciting. The following morning after our first night in the house the assistant Programme Manager took us on our city orientation on the first day. She spoke excellent English which made it very easy to ask questions about the local area. The city was very busy, and there were tuk tuks everywhere. The streets were jam-packed with locals selling their goods on the pavements. We were shown where to exchange money, the shopping mall, and were advised on the best shop to get a local sim card from. We were taken for lunch by the team staff which was a perfect way to get to know everyone before we started placement the next day. Tuesday morning was my first time in a tuk tuk, so I was clinging onto my seat as it weaved through the traffic as we made our way to the hospital. Nandika the Programme Manager took us to the main office where we had our induction. During the planning of the trip, Work the World in the UK had asked for my clinical interests so that I could be placed in areas that I wanted. I choose to split my time so that I spent 2 weeks on the gastro surgery ward, and 2 weeks on the Obstetrics and Gynaecology ward. As I wandered through the various wards, the cultural and financial difference between this hospital and where I work back home was significantly noticeable. The hospital is the seconds largest hospital in Sri Lanka providing free medical services to the local population. Over the years, the hospital has broadened its scope, to provide more facilities to cater for the 2.5 million catchment area they are now responsible for. On a daily basis, I saw first-hand the effects of such a large catchment area. There were often long queues of people waiting outside the outpatient department. This is because they don’t have an appointment system. People queue from the early hours of the morning to hopefully have a chance of being seen by a consultant. Often, people leave without being seen, despite having travelled long distances to get to the hospital, usually presenting late with conditions and therefore there clinical signs and symptoms are well progressed. For my first two weeks, I worked on the gastro surgical ward. It a very busy department within this hospital. There are 4 theatres used by this team out of the 23 theatres, and operative procedures are performed 24 hours a day. It was not uncommon for me to see several surgeries be performed in the same operating theatre at the same time. Most of the doctors spoke English so they were very good at explaining what was happening. On this first morning alone, I saw a herniotomy, fistulas, and Cholecystectomies. I also had the opportunity to spend time in the endoscopy unit. This was very eye-opening. I had watched a gentleman have a colonoscopy using a scope that looked similar to ours back home. Once this procedure was over, he was lifted using his sari from one metal trolley to another and left to wait outside in the waiting room which was also being used as a recovery room. For my last two weeks, I choose to spend my time on the Obstetrics and Gynaecology ward as this is an area that really interests me. My first day was particularly overwhelming, the maternity unit is extremely busy with around 1,000 deliveries every month and 30 deliveries on average per day. The ward consisted of an antenatal ward, postnatal ward, labour ward, high dependency unit and recovery. There is also a lactation management centre, special care baby unit and neonatal intensive care. I was fortunate enough to spend time in the majority of these areas. The delivery room contained 8 beds, less than 1 metre away from each other, surrounded by a curtain which never got used. This meant each mother could hear and see other labouring women. These women would labour alone, as no birthing partners are allowed in the delivery room. 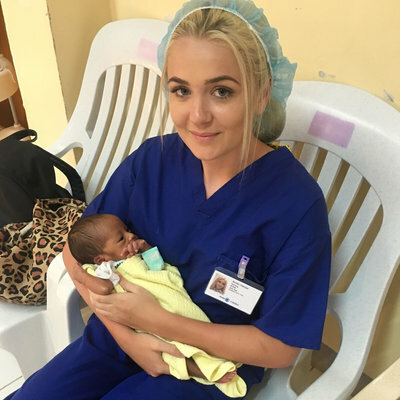 I was able to assist in several deliveries, provide care for the newborn babies, attend ward round, assist with medications, watch several procedures in theatre, and work alongside some amazing nurses and doctors. A funny moment that will always stick with me was an encounter I had with some nurses whilst chatting during a break. Nurses who spoke relatively good English loved to chat and were very interested in where I came from, my family and my hospital in Jersey. They found my Irish complexation and red hair colour very amusing, that one nurse even suggested that I used Olay face cream to remove the dots on my skin; or as I like to call them ‘freckles’. What I found very surprising, was that when it got to lunchtimes in the hospital, I noticed not every patient had food. This was because the hospital does not provide food to its patients. Family and friends provide their relatives with food, so if like many of patients don’t have family close by or at all, they would have to go without. 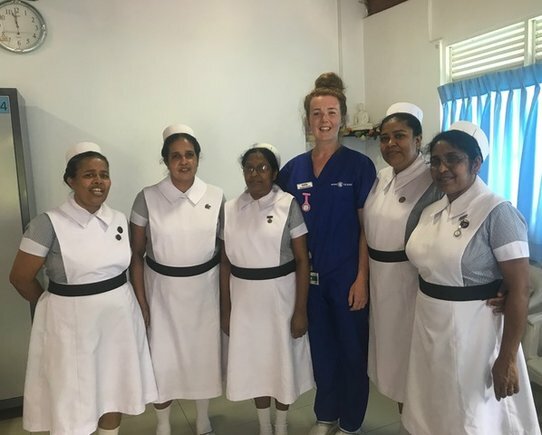 I tried my best to learn basic Sinhalese, however, it is very daunting being faced with a ward full of patients, and having to attempt to speak in a language that was new to me. Occasionally I would recognise a word in ward rounds which meant I had a very brief understanding of the situation. 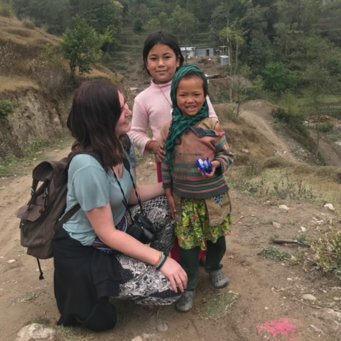 Most of the healthcare professionals speak English, and the hospital notes are written in English, so don’t let the inability to speak the language put you off an adventure of a lifetime! Work the World also offer weekly language lessons in the house to help get you up to speed. During the 4 weeks, we had plenty of time to explore the beautiful country. My weekend would always involve packing a weekend bag as many of the trips are a good 3 to 4-hour drive away from the house. Don’t worry though as a 4 star hotel only costs £4! 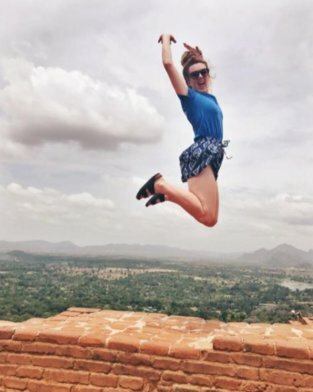 I climbed Sigiriya rock, visited a spice plantation, cycled around ancient temples, stood up in the back of an open roof jeep during an elephant safari; all in the space of my first weekend… and I can’t forget the pool party! 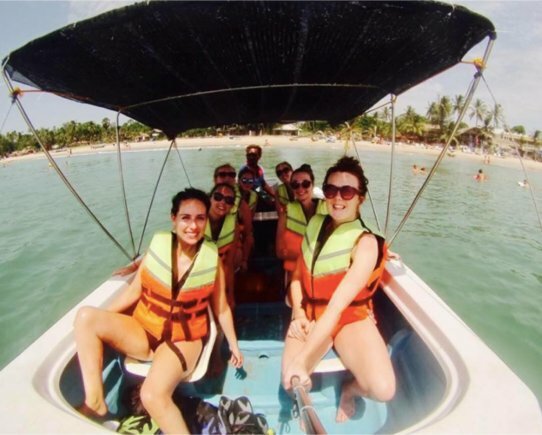 Throughout the rest of trip, we spent a weekend at Trincomalee Beach, snorkelling at Pigeon Island, climbed to the top of World’s End, spent an afternoon at an elephant orphanage and went white water rafting. The hotels nearby also let you use the pool so that’s the perfect way to reflect on the day and cool down after a shift during the week. It cannot be ignored that it is more expensive to undertake an international practice placement. However, I would definitely encourage other students to take up this opportunity if it is possible for them, and I hope that they would have the same rewarding experiences as I did – wherever in the world they would choose to go. Every single day I learnt something new and the experience has been invaluable as I start my final year of my nursing studies. I have memories from this trip that will last a lifetime. I would strongly advise any student thinking of undertaking a placement abroad to do so. You will learn more than just about a different culture, health care system or nursing model, but your values as a person and health care professional will be enriched. 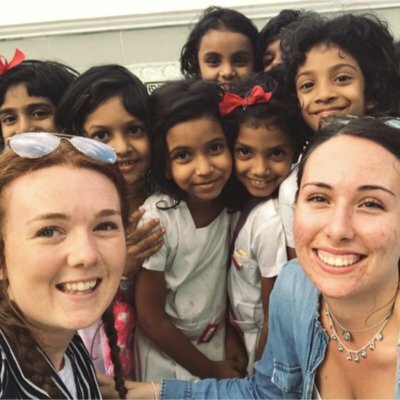 I feel that this experience in Sri Lanka has broadened my horizons, enhanced my communication skills and vastly improved my self-confidence. If I was to give any advice to a student travelling abroad for a placement, it would be to go with an open mind. You will most likely be out of your comfort zone but embrace every moment. When working in the hospital just smile. Despite the language barrier, a smile is the same everywhere. A smile, the right attitude and an appropriate manner go a long way when working with staff and caring for patients.